Sometimes the forces of evil get punished quickly, cleanly, and without outside agency. Schadenfreude permitted. Palestinian cameraman Abd ar-Rahman al-Khatib got burned along witih the U.S. and Israeli flags. 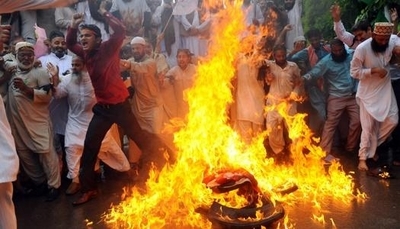 More dangerous than it appears: protesters burn a U.S. flag in Lahore on Sep. 17. Twenty people were injured in Gaza City on Friday as hundreds of thousands gathered to celebrate Fatah's 48th anniversary, a medical official said. Ashraf al-Qidra told Ma'an that 20 people were taken to hospital for treatment after getting crushed among the crowds in al-Saraya square. 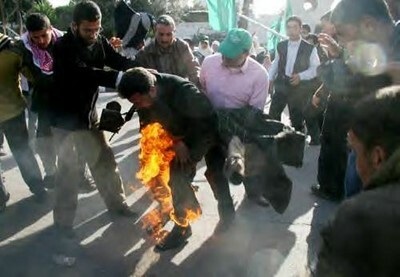 Several other people suffered electric shocks while trying to attach Fatah flags to electricity poles. 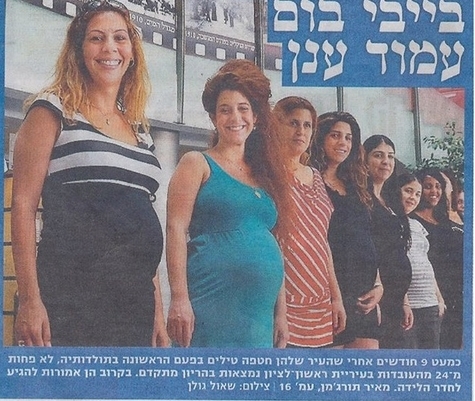 Rishon Letzion women made good use of their having to stay inside eight months earlier. 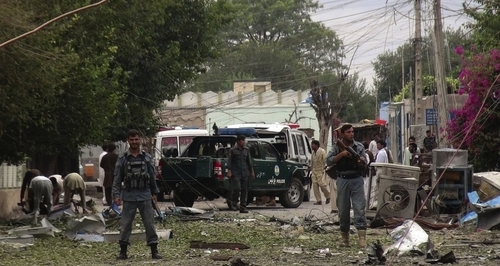 Investigation at the scene of the suicide attack in Jalalabad. Militant Islamist rebels in Syria linked to al-Qaeda have asked for "understanding and forgiveness" for cutting off and putting on display the wrong man's head. In a public appearance filmed and posted online, members of Islamic State of Iraq and al-Sham, one brandishing a knife, held up a bearded head before a crowd in Aleppo. They triumphantly described the execution of what they said was a member of an Iraqi Shia militia fighting for President Bashar al-Assad. But the head was recognised from the video as originally belonging to a member of Ahrar al-Sham, a Sunni Islamist rebel group that often fights alongside ISIS though it does not share its al-Qaeda ideology. 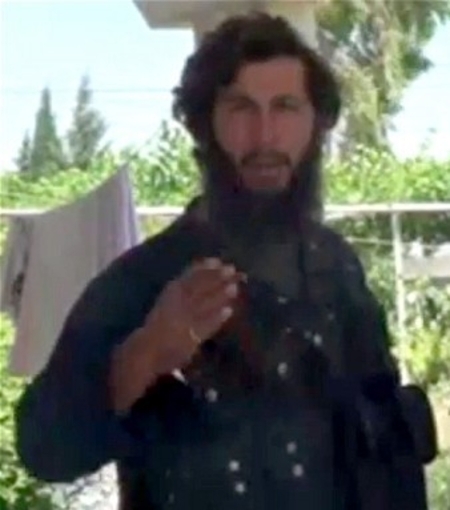 After inquiries, an ISIS spokesman admitted he was Mohammed Fares, an Ahrar commander reported missing some days ago. The late Mohamed Fares, a commander of Ahrar al-Sham, decapitated by his ISIS allies. Syrian rebel blows self up with RPG: Warning: the self-immolition takes place on camera. Del Singh in Gaza showing his support for terrorists. 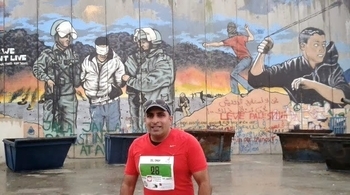 Maybe he wasn't wearing his Gaza marathon t-shirt? ... Del Singh did his best for Muslim terrorists in Israel. Not only did he associate with Labour Friends of Palestine, but he was also a former member of the International Solidarity Movement, better known as I Support Murderers, for their history of involvement in terrorism. "You can call me antisemitic if it makes you feel better but I oppose the current State of Israel and all its stands for," Singh ranted in an old internet comment. ... Sadly Del Singh, while battling the evils of the French and the Jews, appeared to have overlooked the Taliban. Unfortunately for Del Singh, the Taliban didn't overlook him. Hamas knocks out electricity in Gaza: Less lethal but a more widespread injury: a Hamas rocket landed in Kissufim, Israel, where it knocked out the primary wires providing (free!) electricity to 70,000 residents of Khan Younis and Deir al-Balah in Gaza. Although the Israeli government (unbelievable as it sounds) continues to provide electricity to its mortal enemy in Gaza, it decided not to risk the lives of Israel Electric Company employees to fix the power lines. How long will those 70,000 stew? What will their response be? How might this affect the ongoing hostilities? Stay tuned. (July 13, 2014) July 15, 2014 update: Israel blinked first: the government gave permission for IEC technicians, under fire, to restore the power to Gaza. 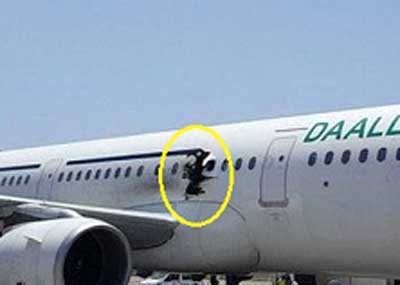 According to an Israel Hayom report, they "were accompanied by Israel Defense Forces soldiers and outfitted with bulletproof vests. They wore special helmets as well to minimize the threat of shrapnel injuries." 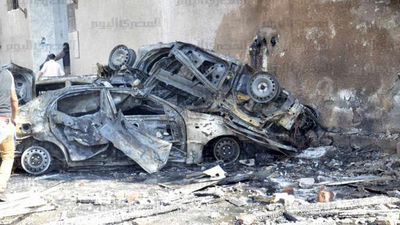 Remains of the Giza car that blew up, killing three. Imam: "Our belief in Allah will increase after today. We will triumph over their deceit and their arrogance. Allah is with us." Worshipers: "Death to America. Death to Israel. Curse upon the Jews. Victory to Islam. Allahu Akbar." 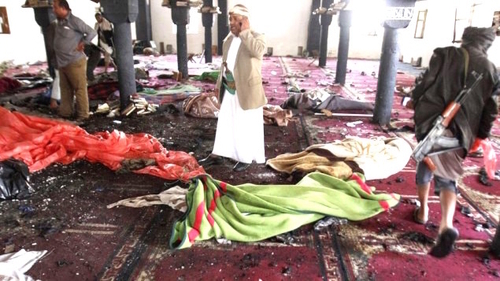 Corpses lie in the Sana'a mosque where toxic sloganeering preceded a bombing. Two would-be suicide bombers have died in Pakistan after an explosive device detonated as they fought each other. ... The two men were killed in an explosion near Khayam Chowk in Sargodha, in the country's Punjab province on Saturday morning. 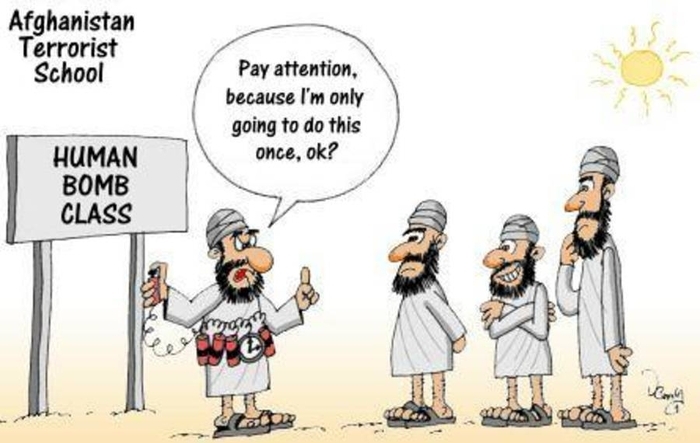 Eyewitnesses claim the men, who were believed to have been wearing suicide vests, were sitting on a bench engaged in discussion before their deaths. It is thought the two men began to fight and an improvised explosive device was triggered. Not quite making it into the category of suicide bomber, an Arab terrorist was killed when the bomb he was about the throw blew up on him. On Monday evening, around 11:30 PM, Arabs set up an ambush on the road connecting Negohot and Adorayim in the southern Mount Hebron area, according to a Tazpit report. The Arabs piled up rocks onto the road hoping an Israeli driver would crash into them, at which point they would apparently attack the driver directly. An Israeli driver from Negohot saw the pile of rocks just in time, and managed to swerve around them. He then called in the army. As an IDF jeep arrived, the IDF soldiers heard a loud explosion. Searching the area, the soldiers discovered the remains of an Arab terrorist who was about to throw a bomb at them. 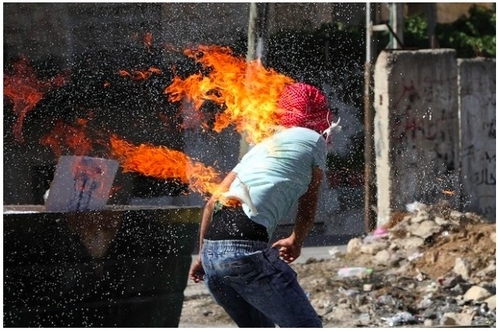 A Palestinian student sets himself on fire while attacking Israelis. Hamas jihadi shoots himself: Imad al-Alami shot himself in the head and was taken to hospital. (January 9, 2018) Jan. 30, 2018 update: Alami died of his self-inflicted wounds. "Two Palestinians Killed When Under-Construction Rocket Explodes": The Jerusalem Post explains: Two Palestinians were killed and one was wounded in an explosion on Sunday in a building in Gaza, health officials said. The cause of the blast, hours after a cease-fire between Israel and Palestinian terrorists in the enclave was announced, was not immediately known. Health officials said the two people killed were a father and his son."